Are you neglecting your silver shoppers? Elderly customers are often ignored as a demographic by the food retail industry. The reason for this seems to be the assumption that they eat less, live in smaller households, have less disposable income, and buy less food. But to dismiss them as unimportant could be a bad mistake to make. Let’s look at what Silver Shoppers actually mean to retailers, and how the supermarket experience could adapted to make the most of this underestimated target group. When considering the older shopper, it’s unwise to take a ‘one size fits all’ approach. Although everyone over the age of fifty may seem ‘old’ to a person in their twenties, there are many different stages of ageing. It’s a gradual process, and it affects each individual in a different way and along a different timescale. What’s more, ‘elderly’ is a relative term which tends to move upwards with the years. People in their sixties often consider only those at least in their seventies ‘elderly’, whereas a healthy 70-year-old may feel middle-aged rather than old. In developed countries, people of retirement age are healthier and more active than ever. So let’s explore this demographic in a little more detail. The advertising and marketing sector itself tends to be populated by young people – maybe that’s why they tend to regard the older generation as a homogenous group. In actual fact, the 60+ age group contains a wide variety of distinctive personas, ranging from homemakers to CEOs, holidaymakers to stay-at-home types, couch potatoes to wildly adventurous fitness enthusiasts, long-married grandparents to childless singles, and so on. The only thing that unites them is that they all need to shop. In addition Silver Shoppers are big adopters of digital, something that is often overlooked. As may be expected, older people are among those who often buy ‘meals for one/two’ , but an increasing number are still feeding a family. Rising house prices, the difficulty in finding a decent house to rent, divorce and job losses are some factors behind the growing numbers of ‘boomerang children’: adults who return to live with their parents when circumstances make this the best option. Although cashiers at your checkouts are no doubt familiar with the traditional sight of little old ladies only buying one tin of cat food, other retirees are catering for dinner parties or purchasing expensive bottles of wine as a regular treat. With the pension age in many countries on the rise, lots of senior citizens will spend more years earning money via a salary or their own business, giving them a larger income than people of the same age a decade or two ago. Upselling is the obvious retail response – many of these people appreciate little everyday luxuries, and can afford to pay for them. As we grow older, our habits tend to stay the same. Brought up in an age when personal contact was considered key, Silver Shoppers are more likely to have an old-fashioned sense of loyalty towards a store where they are made to feel welcome. Nurture this feeling by reminding your staff to treat Silver Shoppers with extra respect, and encourage them to keep coming by using their shopping data to target them with individually meaningful offers. Prepare to think creatively about what Silver Shoppers want in their daily lives. Perhaps they’d like a warm lunch that they don’t have to prepare themselves, and would come to your store if you introduced a friendly area selling soup and just-baked pastries. Or a range of office supplies so that they don’t have to travel across town to the nearest stationery shop. Maybe there’s even an opportunity for their trusted, familiar supermarket to target them with financial services such as travel insurance or even mortgages. Why not? Tesco’s been doing it for years in the UK. Seeing Silver Shoppers as a valuable target group is just the first adjustment that you may have to make. The next one is redesigning your stores so that they become more attractive to the older generation. What that means is seeing the entire supermarket experience through Silver Shoppers’ eyes. If your store is awkward to enter with a walking aid, or the items that an elderly person wants to buy are positioned on shelves that are too high or too low, you could lose sales. Think about your product lines. Practically every supermarket has an aisle for baby food and nappies. How about one for health and vitality? Are you providing enough choice in products such as meals-for-one? Consider how senior-friendly your store is in design terms – and go around it with an elderly shopper to see it through their eyes. Use your shopping data to work out how much this age group contributes to your revenue, what factors trigger elderly people, and how you can serve their needs better. Most of all, change your attitude so that you see Senior Shoppers in a new and more positive light – hopefully, this will be the first step towards future-proofing your store. Every country is different, as illustrated by the various retirement ages globally. Female workers in China (apart from civil servants) have to retire at 50, whereas men and women in Japan, Malaysia, Namibia, Pakistan and South Korea all retire at 60. The Dutch retirement age is increasing gradually from 65to 67, which is already the age at which Norwegians receive their state pension. The overall trend is for people to retire later. LIFE EXPECTANCYTop of the table is Hong Kong, whose population enjoys an average life expectancy of over 83years according to the World Health Organisation. In comparison, the average life expectancy is 80in West European countries such as Germany, Greece, Ireland and the UK; 75 in China; 70in Egypt; 65in Pakistan; 60in Kenya and as low as 49in Swaziland. Clearly, the definition of ‘elderly’ and the duration of this phase are very different throughout the world. The population balance is shifting rapidly. Worldwide, the proportion of the population aged 60or over grew from 8% in 1950to 10% in the year 2000, and is projected to reach 21% by 2050. The United Nations describes population ageing worldwide as “unprecedented, without parallel in the history of humanity”. For at least the next 25years, the older population is expected to continue growing more rapidly than other age groups. This is even more true in more developed nations. By 2025, 25% of people in the US, nearly 30% of the Dutch, French and UK populations, and a third of people in Germany will be aged over 60 (compared to 20% in India, 12% in Pakistan, and 4% in Yemen, the country with the youngest population). This is the area in which differences are most obvious at an individual and local level. For example, UK government figures show that people in a wealthy area of London had nearly £46,000(around €55,000) available to save or spend in 2014, compared to only £12,000(around €14,500) in the city of Leicester. Disposable income for people of retirement age also varies hugely depending on factors such as whether they are still working (including part-time) or have other sources of income such as from investments. Another crucial factor is whether they have paid off their mortgage or are still renting their home. The world population is ageing fast overall, but the effect of demographic changes and economic factors are can vary widely. Retailers should therefore research the number, financial situation, and activities of older people within each local catchment area in order to develop the right strategy for targeting senior citizens living nearby. Older people tend to have more spare time than consumers with young families, and are therefore more able to devote some of it to community activities such as voluntary work. This allows them to build up an extensive network of connections, which in turn enables them to talk about your loyalty programme to lots of other people. If their grandchildren need a few more cards or items to complete their collection, they’ll actively spread the word. With decades of life experience to draw on, Silver Shoppers will examine the household or other items in your programme very carefully. They know how to check for quality, and they’re familiar with brand names that represent it. If you’re offering true value for money – such as a set of glassware that normally retails for a much higher price – they will recognise this and put lots of effort into acquiring it. 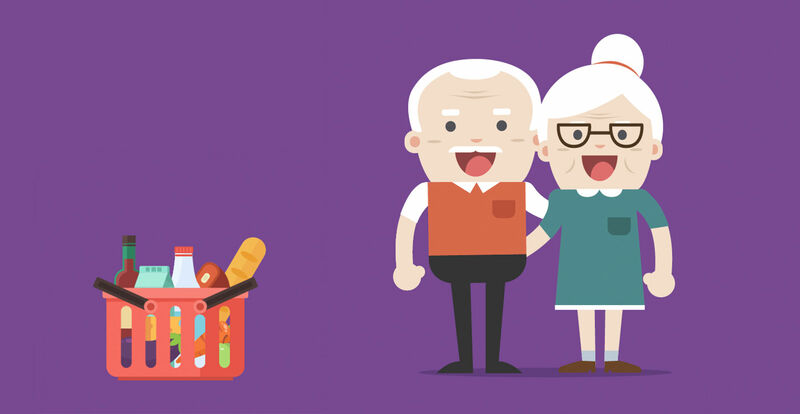 “Granny’s got the one you’re missing!”Instant Loyalty Programmes, in which shoppers receive one or more free gifts at the checkout, are given a huge boost by grandparents collecting these popular small items for their grandchildren. This benefits everyone: the recipients and their parents are grateful, and the grandparents’ ability to provide the necessary items boosts their own status in the family. Collecting for the grandchildren also helps the grandparents to feel involved in the younger generation’s lives, and provides a welcome sense of connection. Without the time pressure of having young children living at home, many older people are at leisure to track down the loyalty programmes on offer at different supermarkets. From their vantage position at the top of the family tree, they can sniff out a bargain and then lead the rest of the pack to it. In other words, they can actively influence where and how other members of the family shop. First published in February 2017.